July 27, 2014. 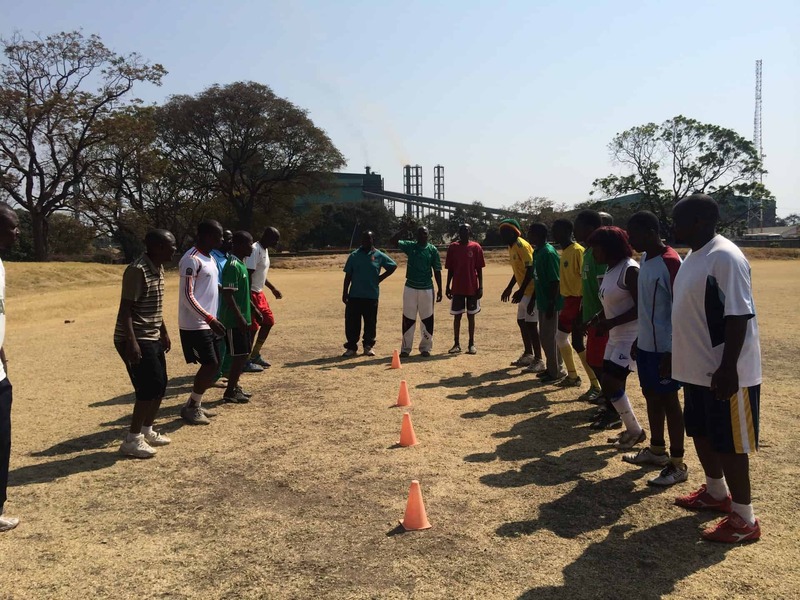 CAC volunteer Layla Joudeh blogs on working in Zambia. After walking into our hotel in Chingola, Zambia, I quickly learned that hotel doesn’t mean working toilets, sinks, or showers. Trying to use a water source in the hotel was like a fun game of “guess whether this bathroom appliance will work today” except our personal hygiene was at stake- so more like a smelly, not so fun guessing game. Fortunately for us and everyone within a 5 ft radius of us, our sink worked fairly regularly and the shower would come through at least every other day. And so began my fifth week in southern Africa. The work week began on a sunny Monday morning (shout out to the dry season for all this wonderful sunshine). Kebby and Able, our hosts from Malalo Sports, were in the taxi that picked us up from the hotel, and we were off to the soccer field. We worked with Kebby and his friend Able for the two weeks we were in northern Zambia. Kebby and Able were excited to have us working in their community and wanted us to feel at home. They arranged all our transportation, organized participants and venues, and paid attention to the details. And the small details they paid attention made all the difference for me. For one, they always made sure we were hydrated with sweet Zambian water. I mean who doesn’t like to have a steady supply of water while coaching? But Kebby and Able went beyond hydration- they actually were getting to know us on a personal level. There was one day during the week when I didn’t feel too well. I didn’t think much of it and planned to sleep it off the following night. I was carrying on a conversation with Kebby on that same day, and he stopped the conversation to ask if I was feeling alright. It was such a simple question that made me want to give Kebby a huge hug. After meeting so many different people in the past few weeks, it was unbelievably comforting to know that Kebby had taken the time to pay attention to the people with which he was working regardless of the number of participants he had to help organize. 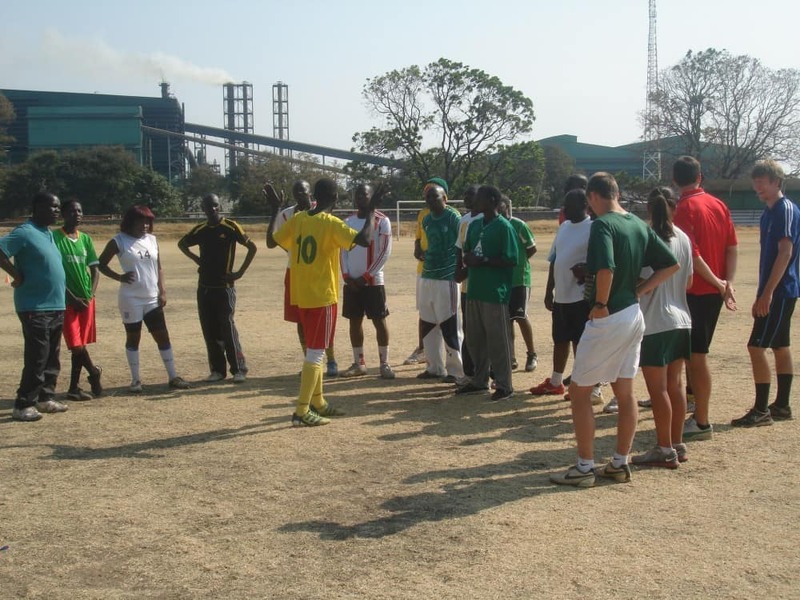 With partners like Kebby and Able looking out for us, it was much easier to focus on coaching. Working with Adam, Charlie, Jamie, and Tim is a whole lot of fun. There was a perfect balance of planning ahead and improvising, making fun of me and making fun of Adam, working together and giving each other the space to lead our own games. We bonded well which helped contribute to my comfort as a coach. Our teamwork on the field made my job a bit easier and more effective. I was more confident because of the three previous weeks of coaching, and I was more familiar with the CAC curriculum. Turns out- coaching is really fun when I actually had a solid grasp on what I was doing. You know what else is fun? Eating. Meal time was one of my favorite parts of the week. Adam, Charlie, Jamie, Tim, and I usually ate lunch and dinner together. We discovered that we had easy access to avocado or as Jamie calls it- nature’s butter. So lunch and often dinner consisted of avocado and cheese. Something as simple as an avocado made me look forward to lunch and sitting around a little table while cats watched us eat. We often ended up mentioning ice cream in our conversation. Our ice cream conversations led us to have an ice cream party on Thursday night. We bought a tub of ice cream and five spoons then gathered in Tim and Jamie’s room. I still can’t decide if the ice cream was good because we really wanted it to be good or because it was actually quality ice cream. Either way- huge thanks to ice cream for being awesome. Speaking of awesome….we even had good wifi in Chingola. In my last blog post, I was thanking my lack of wifi for helping me connect with my environment. However, five weeks of being away from home made wifi a sweet, sweet cure to the homesickness that was creeping in. Contrary to my first week with CAC, I used wifi to share my new experiences rather than stay connected to everything that was happening with friends and family back at home. This change in my internet usage was a subtle reminder that with time, I was becoming more and more comfortable with my environment. As my last blog post predicted (however doubtful I was when I wrote it)- the adventure with CAC has continued and I’ve learned a thing or two. For one- Jamie is right- avocados are nature’s butter. The second thing I’ve learned (because clearly I’ve only learned two things on this trip)- my fellow coaches and our partner programs can make me feel at home even when home is hours away.